she wears flowers: Oh . . . the Drama Around HERE! I love puppets and we own quite a few. We have also cycled through a lot of puppet theaters! I love the tension rod in a doorway kind, but we don’t have any regular door openings on our main floor (except the bathroom and the laundry room both of which face hallways! ) so that idea was out. We used to have an entertainment center turned puppet theater which we all loved, but it took up a lot of room and kind of attracted a mess. Lately, my girls have been using the toy box to perch on as they put on a show over the back of the couch. Enter the PERFECT puppet theater! This fun puppet theater solved all of our puppet theater problems! It is so versatile that you can’t help but love it. It’s cheap and easy to construct. It can easily be taken apart and stored. It can quickly be put back together. It’s lightweight and easy to move. It is also easy to change the size as your child grows or as the space you have for it changes. Several years ago we bought actual plans to make a pvc pipe puppet theater, which we gave to the kindergarten teacher as a Christmas gift. While we still have the plans, there is no name indicating where they were bought from so I can’t give you a link. Luckily, if you do an internet search there are about 14 million results and you can easily find very detailed instructions for making one of these cool puppet theaters. This puppet theater doesn’t follow the plans, but you will quickly realize they don’t have to! I’ll explain how we made ours. Cut your pvc pipe to the appropriate lengths. You can use mine as a guide for what you will need, but adjust to fit your needs. Paint everything—pipes and all connectors. Try not to get paint into the openings because it makes them smaller and the fit will be a little tighter. Be sure to get the edges of the connecting pieces though, since they will show. HINT: Normally, this would be a snap, but the temperatures are still in the 30s these days so I had to be creative! I painted this stuff on a little dowel contraption my husband made for me. It is just a scrap board with holes for dowels. I used a paint can to weight it down so it didn’t tip with all of those dowels wagging around. I kept the materials and paint warm in the house, rushed out to the garage to paint and then hauled it in the house to dry. Very time consuming, very annoying, but very do-able! To make these, you will need 2 pieces (each 21 inches x 36 inches) for the top curtain and one piece (30 inches x 54 inches) (give or take a few inches—this will determine how gathered it is across the front) for the bottom curtain. Serge, zig zag, or hem around the two shorts sides and the bottom of all pieces. For the top, fold over 1/4 inch (or serge) and fold over another 2 inches. Sew in place along the length. This will make the pocket for your curtain rod. The top curtains will overlap the bottom curtain a few inches. I also added tie backs for the curtains. My daughter doesn’t really use them, but they are easy for her to secure herself when she wants to use them. Make tie backs for the curtains. Sew or glue velcro squares to the ends of 12 inch piece of ribbon. Be sure the velcro is on the front for one piece and the back for the other. Sew center of ribbon to the outside side edge of each top curtain panel 8 inches from the top of the curtain. Be sure to sew over the ribbon several times and sew past the ribbon a few stitches on either side. This will help keep it secure. Open the top curtain to put on a show. FYI…The sides, which are there to balance and support also make a great way to define (and confine!) the space, too! This is always important when drama queens get a little carried away with their toys! When you get tired of it, or want it out of your way for a while, or just want to change things up, you can take it all apart and store it away. Woo-hoo!! Bring it out again when you have time, space or a need for it! 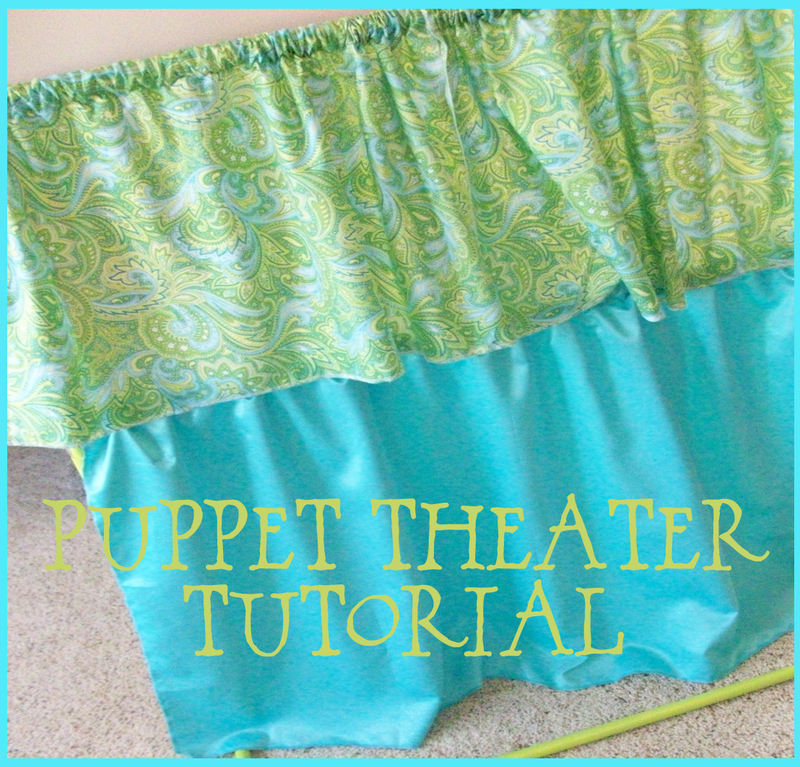 This puppet theater is so easy and fun! Here’s to even more drama in our home! And, as if that isn’t enough, join me later this week for MORE drama and versatility for this puppet theater! I'm linking to the blog link parties in the SIDE BAR--don't miss them! I've been waiting for this post after you hinted at things to come! I LOVE LOVE LOVE the puppet theatre. Knowing how cheap PVC pipe is (and how easy to transport) I know this will be a total hit. So clever and simple but I have to tell you....I have ZERO room for it. But what a wonderful joy for the kiddos! Love it Tammy! How wonderful!! Thank you for sharing. looks like your little one is really enjoying this. fun! Planning to make one of these this summer for some indoor entertainment and to escape the heat! Thanks for the new take on the project! So cute!! What a creative project! I so need (have needed) this for Cub Scouts, and it's the easiest I've seen so far. Hmm. That is fantastic. I just love the fabrics you used too. Nice and cheery! How fun! This is such a great idea. You are a creative genius! And it's much prettier that the one I bought at the store. Such a fun idea for your girls - I love the fabrics you chose for this - I see plenty of entertainment coming your way. I love this! I want to make one for our kids. Thank you for the great tutorial. I love the choice of fabrics you used. This is so great!! My kids would love this!! Thanks for linking up! You are absolutely positively the best mom ever! This is SO cute! I have been wanting to make one of these for my kids! They love to put on puppet shows. Thanks for the tutorial! wonderful! thanks so much for sharing on Craft Schooling Sunday! wow I love it, with my 4 there is always drama in the H-O-U-S-E. Great Tute and thanks for liking up to Make & Share Today! Very nice! Love the colors you chose! Absolutely love it; featuring it tomorrow in this week's A Crafty Soiree! Thanks for shareing, this is great. Love this idea! I've thought about making one of the doorway ones that you've mentioned but we also don't have a good spot for it. This might just be perfect! Great instructions! This is so cute! THis is wonderful...love the paint on the PVC. COuld you tell me about how tall this stands? I want to make one for my Kindergarten classroom and wondering if I need to add some height to it or if you think it might be big enough for 5 nd 6 year olds to play with? @Mrs K--thank you! This is nearly 40 inches tall and probably a little short for K students. I'd just check the height on the wooden ones (available in an educational supply catalog) and change the height to be similar to those. I taught K, too--they LOVE puppets, don't they? The inner drama queen/king always comes out even for the shy ones! Thanks so much for this tutorial! Just finished making one for my niece. 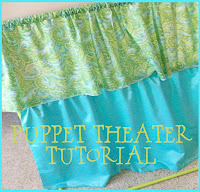 I posted it on my blog if you want to see it http://cutesycrafts.blogspot.com/2011/12/puppet-theater.html. Love it!!! hello! i am going to make one of these for my preschool classroom. i'll be making it a little longer so 2 friends can fit back there. i was curious what diameter PVC you used? 1.25 or 1.5 inch? how durable do you think the diameter you used would be in a classroom setting? thanks! I know this is very durable in a classroom setting because I have used it there! :) The best part is that if they get a little rough and "break" the puppet theater, it goes back together very easily. Worse case scenario--you only have to replace a section or two and pvc is cheap. Good luck--I hope it works the way you envision it! Just finished making this for my kids - what a wonderful idea! It's a little deeper than I would have thought to make it, but no biggie since it's so easily disassembled. I used a slightly longer, wider piece of fabric for the bottom panel, sewed rod pockets on the top and bottom, and wrapped it all around the base pipes. Voila, instant soccer goal when you flip the theatre around!